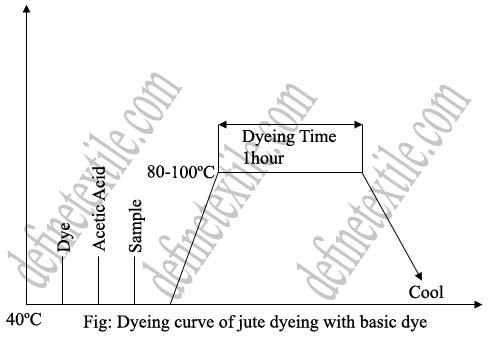 Basic dyes are soluble in alcohol or methyl sprit but do not soluble in water. Basic dyes are suitable for brilliant shade. Fastness properties are average to good. Applied usually jute, cotton and acrylic fibers. No affinity to cotton fibers. Direct affinity to jute fiber and easily to dye. Washing fastness is moderate to good. Acetic acid = 3% OWF. At first, a paste is made with basic dye and acetic acid and with the addition of water. The dye bath is set at 40ºC and adds the dye solution to the dye bath. Then the sample is kept to the dye bath and temperature is raised at 80-100ºC. 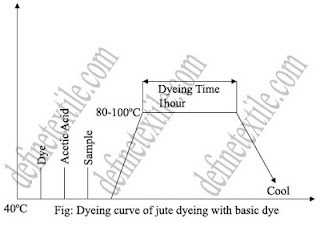 The dyeing is performed at this temperature for 1 hour. After dyeing the dyed sample is squeezed after washing and then drying.